Apple today updated its Apple TV Remote app, which doesn't receive new features very often. According to Apple's release notes, there's nothing major that's included in the update, but it does feature a new app icon. The prior icon was an Apple logo next to the word "TV," the branding that Apple uses for its Apple TV set-top boxes. The new logo resembles the Apple TV Remote, making it clearer what its function is. Today's revamped logo matches the updated logo for the Apple TV Remote option in the Control Center on iOS devices. Apple also changed that icon from the Apple TV branding to a remote control design in the iOS 12.2 update. iOS 12.2 brought other changes to the Remote option on the iPhone and iPad as well, introducing a design that is darker, more streamlined, and takes up the majority of the iPhone's interface. 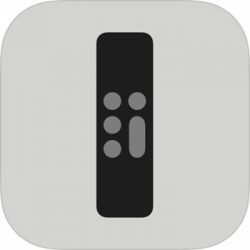 With a full Apple TV Remote available in Control Center on modern devices, there's little reason to download the standalone Apple TV Remote app. Apple is, however, still keeping it around, and according to today's release notes, version 2.2 brings "general performance and stability improvements" along with the new app icon. Am I the only one who miss this? Very fitting. Crap logo of a crap remote. It couldn’t be uglier. Honestly, it shocks me that someone with eyes said ok to this. This is the problem with flat design. It is clearly limited to the point where you can end up getting crap like this. When you could imagine doing this yourself in under 2 minutes in Microsoft paint using the most basic shapes.. it doesn’t exactly scream quality. The Watch app's icon is still the worst one of them all. That’s THE BEST they could do?!?! Jesus! !